New Delhi, Jan 31: The 4th annual Carnot Prize was received by Union Minister Piyush Goyal for his contribution in policy formation. 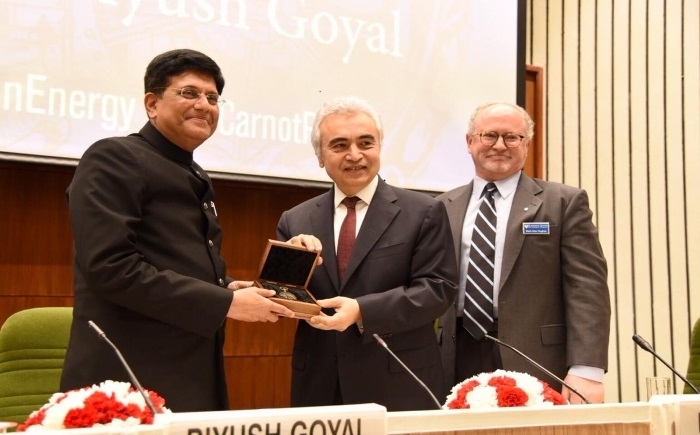 The Kleinman Center for Energy Policy at the University of Pennsylvania School of Design formally presented the Carnot Prize to Union Minister Shri Piyush Goyal at Vigyan Bhawan, New Delhi. Shri Goyal had previously been unable to accept the award in the United States of America, due to to the unfortunate train tragedy that took place in Amritsar. Further, he added, I truly dedicate the Cornet Prize to the lakhs of Indians engaged in the energy and mining sector and the Visionary guidance of PM Modi, for transforming us from an energy-short nation to a nation with power-surplus. He decided that the award money which he will receive will be donated to the International Solar Alliance to institute, the Diwakar Award. The Diwakar award will recognize, every year, an outstanding organization that has been working for special children and maximizing the use of solar energy. The 2018 Carnot Prize is a recognition of India’s efforts towards eliminating energy poverty with sustainable energy solutions. The rural electrification drive helped in achieving ‘24x7 Affordable, Environment-Friendly Power for all’, as India eliminated decades of darkness in more than 19,000 villages on 28th April 2018.